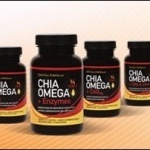 September 25, 2013 — One of four plant-based omega-3 formulations recently launched by Essential Formulas Inc. (EFI) has been honored for its use of high-protein chia seed oil combined with key dietary and antioxidant support for optimum health and convenience. Chia Omega + Vitamin D3, a certified vegetarian product, was recently honored with a “Best of Supplements Award” in the New Supplement category by Better Nutrition Magazine. In its sixth year presenting the “Best of Supplements Award,” Better Nutrition Magazine selected the winners from manufacturer nominations, natural health retailer’s survey, and input from the Better Nutrition’s Advisory Board, which consists of naturopathic practitioners, journalists, and staff. Chia Omega + Vitamin D3 is marketed as leading the way in combining cold-pressed chia seed oil with highly bioavailable vitamin D3. Known to support both bone health and healthy mood, vitamin D3 is a synergetic addition to omega-3, known to help support healthy heart function and mental cognition. “We knew there was a market for a fish oil alternative and are excited to be able to offer a vegetarian omega-3 option that not only eliminates fishy aftertaste, but is also is believed to be a better omega-3 overall,” said Michael Schoor, CEO and president of EFI. The award will be presented during Natural Products Expo East, Sept. 26–28 in Baltimore.